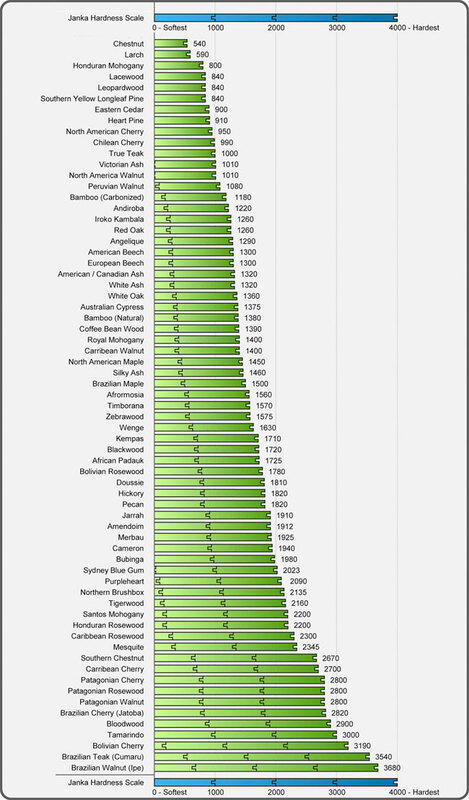 The following is a sample of a Janka Hardness chart. If you are choosing a solid or engineered hardwood you may or may not have heard about the Janka Hardness scale. The Janka Hardness Scale measures woods ability to resist pressure placed on its surface. The better the resistance of the floor, the less denting will occur. Our goal here is to take the confusion out of this area to better educate you on what it means to have woods with varying hardness ratings and how it is so often confused with durability. Durability as defined by Webster’s dictionary is: able to exist for a long time without significant deterioration. Listed in this chart are numbers representing the rating of hardness in relation to the species from softest to hardest. Notice that out of the species shown Chestnut is the softest and Brazilian Walnut is the hardest. It seems simple if you use only hardness as your guide to durability, you will conclude that Brazilian Walnut is the harder, and therefore more durable than Chestnut. That is incorrect! The hardness of wood only has to do with how dense the cell structure of a species is and how that density will resist denting not durability. Technically, deterioration of a wood floor can solely occur if the surface of the floor is wearing down – the finish, not the wood itself. Dents, scratches and similar types of abuse are not relevant when it comes to durability. The more durable a floor is the longer the finish will last before requiring a re-coat. Meaning, it will take more abuse before it really begins to look abused. The real question that you should ask is how much the floor will dent, not if the floor will dent. The problem that most customers have is due to all of the new finishes available; most of them include Aluminum Oxide (or some variant thereof) and now feel the floor will be indestructible. Unfortunately, these misconceptions are being encouraged by some of the companies involved, but in the end the flooring that we use is wood and wood dents. Therefore no matter whether it’s Brazilian Walnut or Chestnut – they will all dent and they will all scratch.